How to make a DIY Foot Scrub at home? The least bothered part regarding beauty is our foot. We put utmost efforts to maintain that glam on our face, but when it comes to foot, we never find a little time which may end up in the cracked foot. So, at that moment we opt for the expensive pedicure. I’m not against pedicure, but it is important to take care of our foot regularly. So, In between your pedicure sessions, you can treat your foot at home with homemade foot scrubs or DIY foot baths. It can protect our foot from various infections, cracked heals. So, prepare homemade foot soaks and relax. Using Listerine for foot may sound a little weird, but don’t worry, it makes wonders on your cracked heels. Listerine foot soak is the best remedy for heel fissures. Many people with severe heel cracks also got some best benefits with Listerine. Add Listerine to bath tub water and soak your feet for about 25 minutes. This natural scrub recipe removes all the dirt and dead cells from your feet and gives you smooth and silky feet. 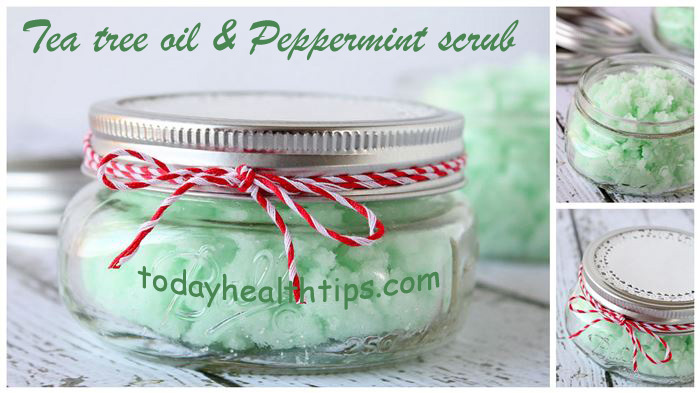 This DIY foot scrub is the most popular foot scrub that we can use regularly. Add all the ingredients to the water and such that your feet completely dips in the water. Also, you can use Listerine foot soak without vinegar by just adding Listerine to warm water. Epsom salt is also known as the best bath salt or pedicure salt. Epsom salt when gets wet breaks down to Magnesium and sulfate. So, these salts enter your body through the skin and relax your muscles and also loosen the stiff joints. Vinegar helps in reducing inflammation. So, use this foot soak once in a week to relieve your joint pains. Fill your bathtub or foot bath basin with warm water and add the vinegar to it. Then add a handful of Epsom salt or sea salt. Soak your feet for 20 minutes. Also, prepare the same mixture using cool water. Use at least once a week to maintain healthy feet. You can use this Epsom salt as homemade bath scrub recipe too. Rosemary and rose petals give us intense fragrance that elevates your mood instantly. So, use this scrub not only to treat your feet but also improve your state of mind. It is the best relaxing at home foot scrub which is easy to prepare and use. The easy homemade foot scrub recipe can be made within 5 minutes. So, learn how to make a homemade foot scrub for yourself. To prepare the Rosemary sugar foot scrub, collect some fresh rose petals, rosemary twigs. To this add a half cup of sugar and use sesame oil or olive oil to form a coarse paste like texture. Gently massage this scrub on your feet for 5 minutes and leave it as such for 30 minutes. Later, rinse your feet with warm water and apply moisture. The best part of this rosemary scrub is you can also use this for our face. Sea salts and sugar are the best exfoliating agents that we can use on our skin. Also, the tea tree oil in the scrub acts as a freshener. So, use this refreshing exfoliating scrub twice a week to remove darkness on your feet. This DIY foot scrub is simple and easy to prepare. So, give yourself a home foot spa treatment with this tea tree oil recipe. Take half cup of sea salt in a bowl and add 2-3 tablespoons full of olive oil to it. Just mix them well and add few drops of tea tree oil and peppermint oil to it. Mix them again and ensure the coarse texture of the scrub. If you are suffering from the cracked feet, this scrub may cause slight irritation. But, don’t get panic. The tea tree oil and sea salt will act against any microbes present on the cuts of the cracked feet, so this might cause some irritation. The simplest of all DIY foot scrubs is olive oil and brown sugar scrub. You can prepare this natural scrub or pedicure scrub within no time. So, even if you are in a hurry, you can manage to do this. Also, you can use this exfoliating scrub regularly before you take a bath. Just Mix a tablespoon full of each olive oil and a tablespoon full of brown sugar. Also, add a teaspoon baking soda if you wish. We can use this homemade foot scrub even for dark knees and elbows. The Brown sugar helps in exfoliating the skin whereas the olive oil moisturizes and nourishes. The baking soda in the scrub can remove the dirt and lighten the skin tone naturally which makes it a perfect DIY foot scrub. The sugar helps in exfoliating which remove the thick dead layers. So, you can own soft, fair foot which looks impressive. Also, add few drops of essential oils to get the fragrance that relaxes your mind and body. Take a cup of granulated sugar (if you want to store it) and also 1/4 cup of almond oil. Collect lemon juice from 3 lemons and add it to sugar scrub. Remember the scrub should be coarse as it acts as an exfoliant. Add all the ingredients in a bowl until the mixture gets wet. You can also add lemon essential oil instead of lemon juice, but fresh lemon juice is preferable. Refrigerate this scrub and use whenever necessary. Gently rub on the feet and rinse with warm water to finish it off. So, these are the best DIY Foot Scrubs that can bring out a change in your tired feet. If you can’t even spend the time to prepare these Homemade foot scrubs, then just add few drops of essential oil to your warm water and soak your feet for 10-15 minutes to relax them. Wear comfortable shoes to let your feet breath in. Try to use any of the above foot baths at least once in a week. 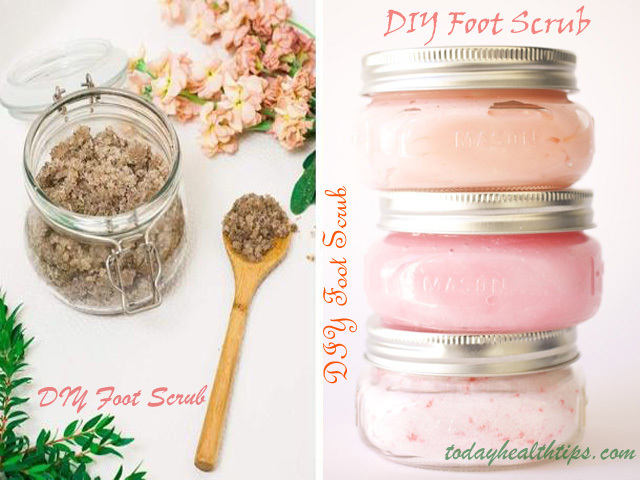 If you know any best DIY foot scrub than these then just post a comment in the comment section.